For once Israel is telling a part of the truth. It was impossible for any of its own (Israeli-Jewish) agents to get into the rubble of Arafat’s compound to administer the poison that killed him. But they didn’t need direct access. Israel’s role was to provide the radioactive polonium for one of its collaborators in Fatah’s leadership. I was convinced that Arafat was as good as dead before he died. What I mean is this. I was watching live on television as Israel prepared to announce that it was going allow Arafat to leave by helicopter for Jordan and then on to a military hospital in Paris. 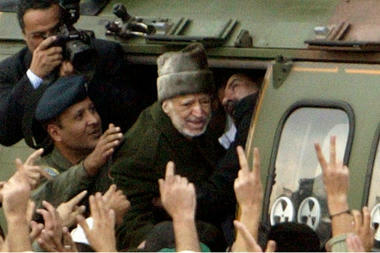 Up to this moment Israel’s position was that if ever Arafat left Israel-Palestine, he would not be allowed to return. As to who the actual assassin was, there’s no mystery about that either as far as many Palestinians are concerned. He is the man who, with American endorsement and Israeli military back-up as necessary, was going to lead Fatah’s security forces in what he thought would be a short, sharp war to destroy Hamas in the Gaza Strip. It didn’t happen because Hamas got wind of the impending attack and launched an Israeli-like pre-emptive strike against Fatah’s forces and drove them out of the strip. He is also the man who, today, is plotting and scheming to replace Abbas as Fatah’s leader and “President” of Palestine. My own view is that Abbas should not be replaced by anybody and that the discredited, corrupt and collaborator PA should be dissolved in order to hand back to Israel complete responsibility for its occupation. That might make it less than a mission impossible for Israel to be called and held to account for its crimes. On other and current matters… I have reached the stage where I have to turn the sound down to off when Netanyahu and his spokesman Mark Regev are talking about Iran. I can’t take any more of their propaganda nonsense. In Regev’s case his body language suggests to me that he is inwardly uncomfortable with having to speak such rubbish. I agree with you about Regev, Alan. If there was a world community not infiltrated by "fifth columnists" and willing to hold Israel accountable for war crimes the Palestinians would be infinitely better off without the sham PA and sham "peace process". Since this isn't the case, the third intifada may have to begin. The Israeli response, I think, will be to drive the Palestinians into Jordan and elsewhere and kill those they cannot move. This may finally get the UN and even the U.S. to actually do something. When Arafat was besieged in his room inside the wrecked Muq'ata and IDF soldiers were swarming the compound, it was reported about noises arising at night from tempering with the wall interfacing the corridor. Were the Israeli agents planting some "mysterious" device inside that wall? The answer to that most likely awaits an Israeli whistle blower. My sentiments too Mr Hart. Re TheConversation: Nov 7 2013 a link from subscriber Peter Dawson. The discomfort you see in Regev, Alan, that's the little part of Australia left in him. He did have "enemies within" Elizabeth, and support your deep sentiments of sympathy towards his wife for the loss of her husband and father to her children. Whatever Mohammed Dahlan is doing these days, he must be very worried about his back. He must be the most hated man amongst all people who love Palestine, no matter who they support. He is a traitor, and we all know he is the US./Israel/s collaborator/spy/assassin/enforcer. Now he probably lives in terror.